Make sure to look for Happy Surreal Peanut Butter, pop art peanut butter, pop surrealism peanut butter, pop art cookie, pop surrealism cookie, pop art popsicle, pop surrealism popsicle and all the other fun images found at . 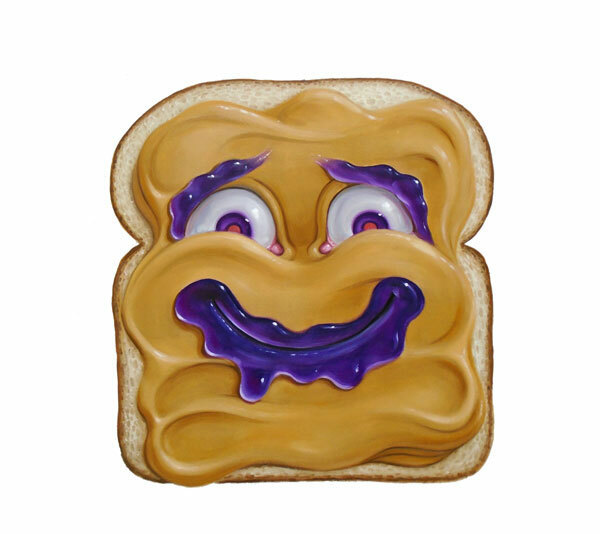 If you have ever seen a happy surreal peanut butter sandwich then you have been bestowed with infinite good fortune and should buy a lottery ticket immediately. If you happen to eat a happy surreal peanut butter sandwich then your good fortune will be shared with everyone you come in contact with. Make sure to wash it down with a nice cold glass of fresh chocolate milk. Meditate on your favourite Canadian pop surrealist painter and all will be well. This entry was posted in Canadian Surrealism, Surrealism and tagged art, bubblegum surrealism, canadian pop surrealism, canadian surrealism, contemporary art, happy surreal peanut butter, peanut butter, pop surrealism, stephen gibb, stephen gibb art, surrealism. Bookmark the permalink. Both comments and trackbacks are currently closed.